STOP is an acronym created to help with dealing with physical, emotional and mental pain. It helps you deal with negative self-talk by being giving towards yourself and through dealing with issues constructively. The above steps are not always sequential. Nor do all of them need including in every incident. However, explicit practice of the steps will enable you to make sure that a range of important principles is included. For example, recently a student of mine told me that she went home and taught her teenage son STOP after she heard me talk about it. 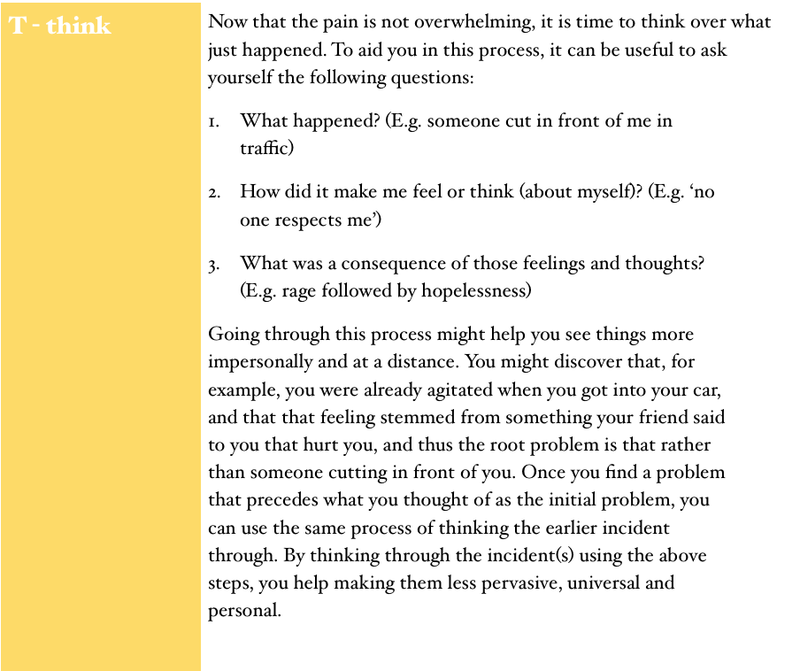 Through the explicit teaching of STOP to her son, it became apparent to both of them that he was pretty good at doing the first steps intuitively (soothe, think, ownership), but tended to ruminate over things and blame himself for any mistakes a long time after the incident (lack of letting go and play). By becoming consciously aware that this was what he was doing made a difference. It is an example of how any explicit strategy can act as a starting point, and that the principles have to be adapted and applied to every individual’s context. 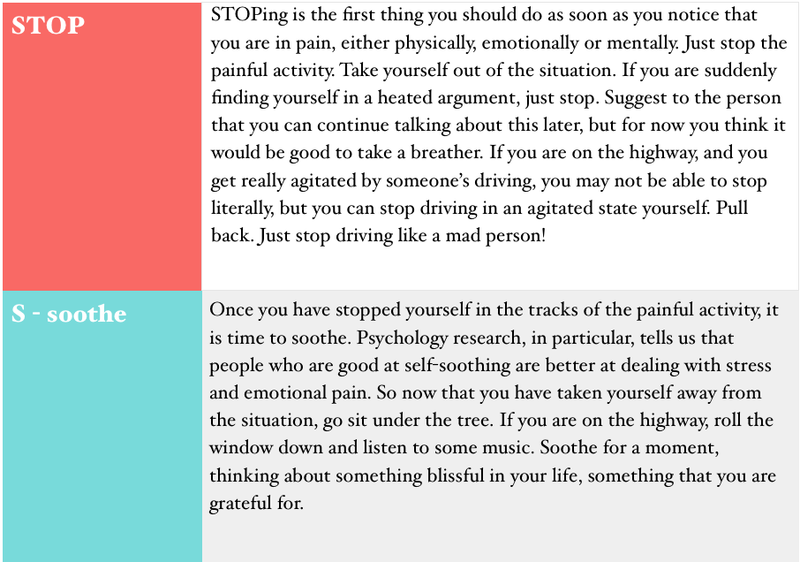 Most of us will do versions of STOP intuitively when in pain. But many of us will also have certain dispositions, and it is through becoming aware of these that we can more consciously accommodate our weaknesses. 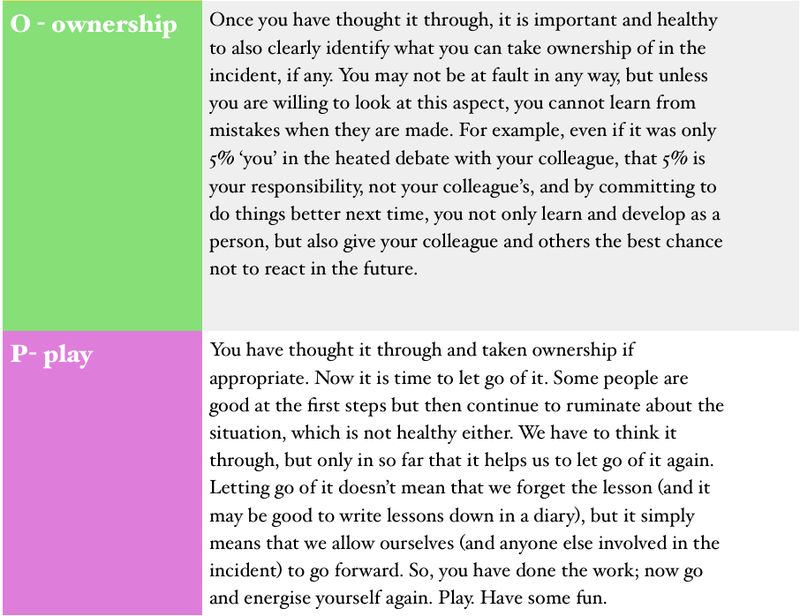 Note: If you liked or found this model useful, you may also benefit from Martin Seligman’s ABCDE method of intervention and change, which can be found in his book Authentic Happiness: Using the new positive psychology to realise your potential for lasting fulfillment. New York: Free Press, 2002. As the aim of the Curriculum of Giving website is to educate and disseminate wellbeing information freely amongst readers, you are free to share or republish content you see on the website given that the content has not already been published in print or online form in a book or journal. Additionally, please make sure to always credit the author, Dr. Nielsen, and reference the content to the original website link, as this website is a compilation of Dr. Nielsen's original research and theoretical work. Lastly, unless you have express permission from Dr. Nielsen, it is requested that you do not edit or alter the original work in any way. This website is updated and maintained by Jennifer Ma.